Across the industry there are several different approaches to fitting contact lenses. 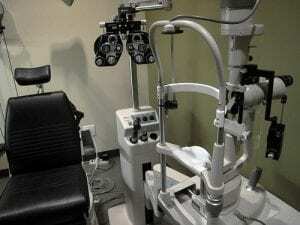 Some optometrists charge a very low fee for the test, but you’ll quickly try on a lens and then be sent on your way. We at Visual Q Eyecare do not agree with this rushed method. The size and shape of each human eye is unique in terms of its curvature and measured diameter. Please, do not believe in a one-size-fits-all contact lens mentality. Physical Fitting: As part of our extensive range of contact lens eye tests, first we measure the size of your eye. We then undertake a process of physical fitting, trying on a succession of different lens brands and styles. Next, we check under a Biomicroscope to see your lid lens iteration, as various lenses (that are technically the same size and prescription) sit differently upon the eye. Optometry equipment is complex, so time should be taken to obtain the optimum diagnosis and prescription. Prescription: People that are short or far-sighted need a spherical shaped lens. Those with astigmatism use a ‘toric’ shaped lens. Did you know astigmatism affects 40% of the glasses-wearing population worldwide? It is not a disease; rather, the eyeball is shaped like a football. Not everyone with astigmatism needs to have his or her eyes corrected. Lastly, there are multifocal contact lenses for those aged 40 and above. These people have Presbyopia and need ‘reading glasses’. Prescribing toric and multifocal contact lenses involves a number of complex and difficult procedures, which means more time in the optometrist’s chair. A lot of people fitted with these types of contact lenses are not getting the amount of time it takes to be fitted correctly. Statistics show only around half of these types of prescriptions are fitted to the correct specifications. Modality: What is the main purpose for your contact lenses? Are you going to be wearing them everyday? If so, you’ll need either fortnightly or monthly soft lenses. If you want to use contact lenses only part-time, for example, while playing sports once a week, or for social occasions where you don’t want to be wearing glasses, daily contacts are the answer. These contact lenses do not need to be cleaned; you simply wear them once and then dispose of them. Note: Custom-made contact lenses made for people with odd eye sizes are unavailable in disposable form. These are usually offered in a single-year soft lens.